I'd come across this cover before during some of my many frequent visits to the local video stores back in the 80's and 90's, but it never drew me in so I never gave it a shot. Flash-forward several decades and while seeing a film at The Alamo Drafthouse recently one night, they show this trailer for an upcoming screening. That trailer had me, and since I knew I couldn't make the screening since I live 5 hours away, Not knowing what it's even about, I grabbed myself a copy, so let's dig in. 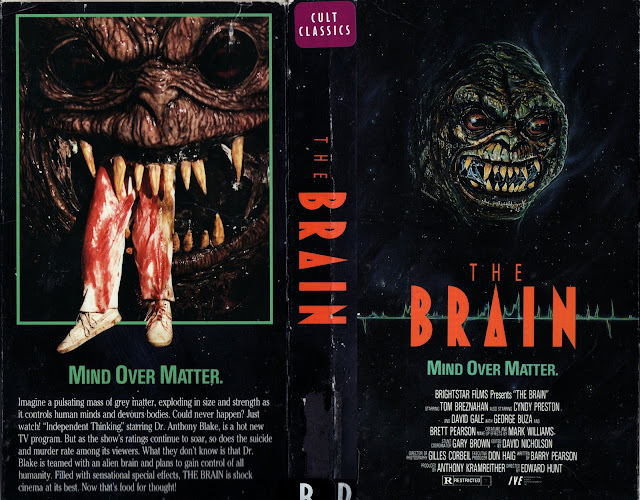 A small town high school kid must stop an evil alien being, along with the alien's accomplice - a popular local enigmatic television host, intent on controlling the world by brainwashing every human being on the planet through television reception. I never know what I'm getting into with these types of films. Just from the trailer, I already knew it was going to be cheesy, which was perfect, because I loooooove 80's horror cheese. It's the best. But it's not always successful and can be a really hard thing to pull off correctly because it's all in how they handle it, and whether they're doing it intentionally or if it's just a happy accident. It's typically the happy accidents that end up being the best and most memorable and The Brain easily falls into that category and it's a blast from start to finish. The Brain was pretty much I hoped it would be, in that it was fun, cheesy, very 80's, and had some nifty practical effects work that makes it better than I was expecting. Not great mind you, but it sure was fun. It's also ridiculous, with some hilariously awful dialogue, acting, and a story that's just the right amount of dumb and entertaining. There's no way this film was meant to be taken seriously, but it's sure played that way and for that, it rises above your standard schlock. It also helps that for a film of this......budget, it's rather competently made. Or as competently made as a film like this could be I should say. It's not lazy, which is a huge plus, and the acting for the most part isn't bad, but there is definitely some bad acting to be found in here. I think the most surprising thing for me was seeing David Gale (Re-Animator) in this. And if you haven't seen this yet, just wait till you see what they do to him. Oh it's glorious. This highly entertaining slice of low-budget goodness comes from frequent collaborators Edward Hunt (director) and Barry Pearson (writer), who also worked on Plague (1979), Bloody Birthday (1981) and Alien Warrior (1986) together among others. I've actually owned Alien Warrior for years now and still have yet to actually watch it. Maybe it's time I get to that. But I was surprised with Hunt's work on this one. While not exceptional, it's fairly competent (surprisingly!!) and retains some rather clever camerawork to compensate for lack of budget and effects, which only adds to it's overall charm in a positive way. This film won't change your life or anything, but it sure is a helluva good time in the "low-budget 80's horror cheese" department and a far more entertaining film than I was expecting going in. To be honest, I'm surprised it doesn't get much love or even an upgraded release complete with all the bells and whistles. But hey, if Blood Rage (as obscure as they come) can, then maybe The Brain isn't too far behind. I can't say that the current price tag for the VHS and Laserdisc are justified, because while I did really enjoy it, I would probably never pay those prices. But that's just me. And unfortunately, those are the only 2 legitimate releases we have here in the states as a legit DVD and Blu Ray release of this classic is still not currently in the works as far as I know. If I'm wrong, please let me know. Thankfully there are a few other avenues. For starters, it's usually available on YouTube for free. And if you just need a physical to hold in your hands, there are plenty of bootleg's around from various sites at a cheap price. Obviously they'll be sourced from the VHS or Laserdisc release, but something's better than nothing.